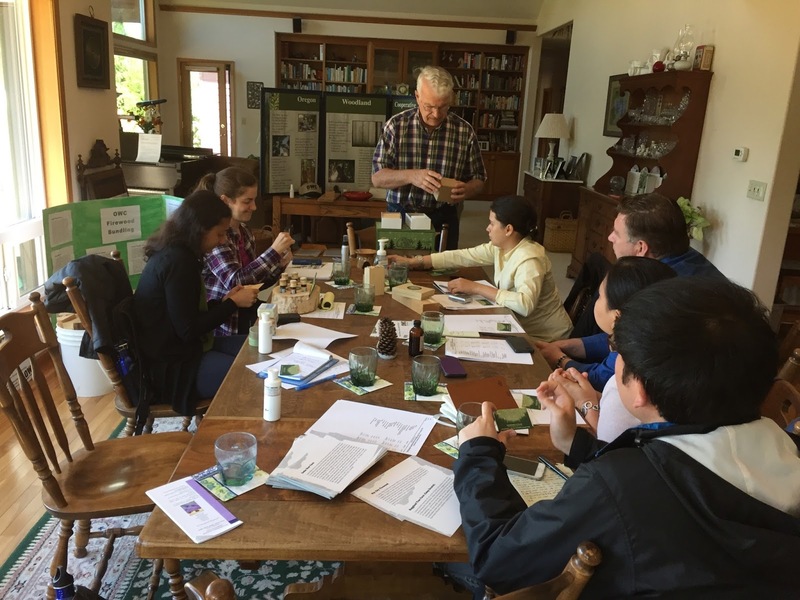 The Oregon Woodland Cooperative: Using non-timber forest products in creative ways! On this day we visited Neil and Ardis Schroeder's home office in Beaverton. They welcomed us with warm smiles and fresh grape juice from their backyard's vines. Neil is the president of the Oregon Woodland Cooperative (OWC), an organization founded in 1980 that currently has 70 members, all private forest landowners who own and manage family forest farms. The Coop educates its members on forest best management practices and non-timber forest products development for extra revenue. The cooperative also provides support with the marketing and distribution of these non-timber forest products. Following are some of the products distributed by the Coop: bundled firewood, essential oils, decorative wood pieces and fresh-vine arrangements which are sold in local stores around the Portland metro area and Salem. The bundled firewood are bundles of 16 x 9 x 9 inches wood pieces. The fresh-vine arrangements also called “evergreen boughs” are sold for decorative purposes to florists. Currently, the Coop is commercializing 6 kinds of essentials oils in 5 ml bottles: western red cedar, douglas fir, incense cedar, ponderosa pine, grand fir and noble fir. The bottles have a beautiful label paired with an information flyer on the attributes and uses of these evergreen oils. The Coop's marketing strategy focuses on finding niche markets that already offer local, fresh, organics products to their customers (people that already care about consuming local and sustainable products). The Coop uses strategies like 'story telling' of 'where the product comes from' to connect the final consumer to the product/producer. For example: Each firewood bundle showcases a different forest farm story, and people like them so much they started to collect them.The work of this small cooperative is really inspiring! My research project at the WFI focuses on identifying environmental, social and economic benefits of organizing private forest landowners. In Nicaragua, forest management practices that provide economic benefits to the landowner are critical to reduce the pressure for land conversion to agricultural land. Small forest landowners have a hard time making a living by managing their land for timber. Timber production is a game of scale and the smaller the land the harder it gets! This is why organizing small forest landowners for developing and commercializing non-timber products sounds like a very enticing model for the small Nicaraguan forest landowner. Creativity is a key ingredient in innovation. The Coop is looking for ways to use otherwise residues, defective or overlooked parts of trees to make products that are useful for certain audiences. Sound marketing is a vital part of any business. The Coop looked for the support of marketing professionals and designers to assist them in creating a strong brand. Even as a small business Coop their label designs, packaging and marketing strategy are first class. Dedication and continuous improvement are required to achieve success. The Oregon Woodland Cooperative has leaders dedicated to making their business model a success for all their members. Neil, Ardis and their colleagues are continuously looking for ways to improve their products quality and variety as well as exploring potential new markets for their products. This day we visited H.J. Andrews Experimental Forest. Mark Schulze the director gave us an introduction to the organization and showed us the different long term data collection stations. According to the Mark Shulze's introduction, H.J. 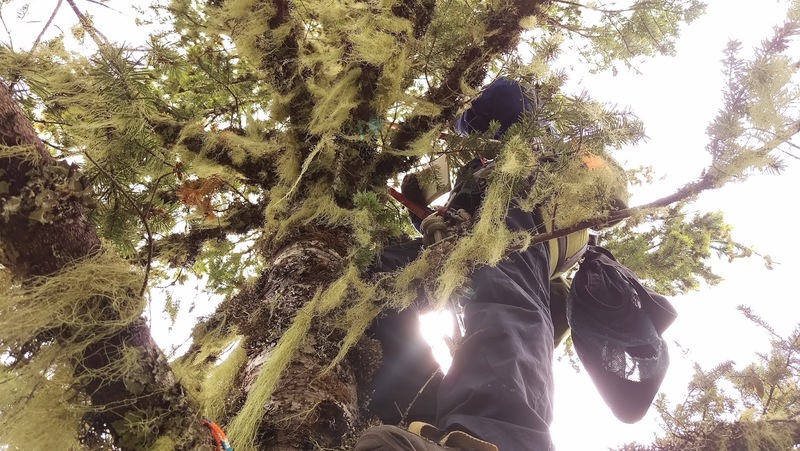 Andrews Experimental Forest research focuses on Pacific Northwest tree species like -Douglas-fir as well as over 500 vascular plants. Besides species richness, H.J. Andrews Experimental Forest has various types of geo-ecological systems that researches. Over the decades many different types of research has been conducted at H.J. Andrews Experimental Forest. Current research includes watershed dynamics, forest development, carbon dynamics, remote sensing and landscape ecology. Research findings support American forestry. The H.J. Andrews Experimental Forest is equipped with high tech equipment to meet long and short term research needs. China also counts with experimental forests for long term research and the government allocates great importance to them. And thus experimental forests are great in numbers in China, experimental forests like H.J. Andrews Experimental Forest are rare. The main issue that limits research is the lack of data sharing that enables unnecessary research replica that hinders research advancements. International Fellows: Abiodun Solanke (Nigeria), Andrea Cornejo (Nicaragua), Karishmaa Pai (India), Samantha Kwan (Malaysia), Yu Lei (China), Ana de Miguel (Spain). Boardman Tree farm was a 25,000 acres poplar plantation in eastern Oregon. This plantation, as other hybrid poplar (Populus ssp.) plantations, was established in the early 1990’s for the pulp and paper market. In 2007 GreenWood Resources purchased 17,000 acres of Boardman Tree farm and subsequently the rest of it. Solid wood markets were developed due to the low prices of the wood-chips. The poplar tree farm is a FSC (Forest Stewardship Council) certified plantation and the wood is marketed as Pacific Albus. The genetic improvement research was paired with silviculture research to find the best growing techniques and breeding program to provide improved material for the plantation. Polar at the Boardman farm was grown on a 10-12 years rotation bases and was used to produce lumber, veneer and pulp chips. Collins has been processing the wood at a mill located in the middle of the plantation and then managing the lumber sales. Collins was able to improve the historically bad reputation of poplar in the lumber industry. Proof of it is that Pacific albus is now an industry desired lumber. A vast area of the Pacific Northwest (west of the Cascade Mountains) is comprised by Douglas-fir associated in moist forests, which is Oregon's main timber specie. Recent studies indicate that canopy structure and microclimate might influence the degree of Swiss needle cast (SNC) incidence on Douglas-firs, which impacts significantly the local timber industry. It turns out that water dynamics are important because leaf wetness during May- August drives the success of needle colonization. During current climate change, research related to 'the dynamics of canopy microclimate with this emerging disease' is urgently needed. 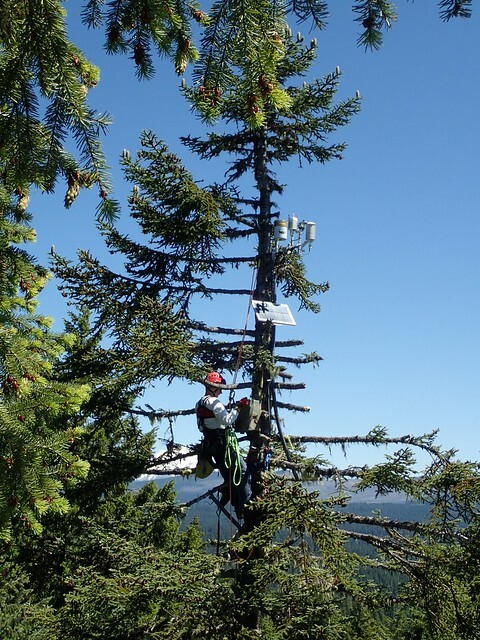 During my fellowship at WFI, I was invited to do field work with EPA, installing weather stations, and measuring canopy allometry on old-growth Douglas fir trees. Following are the lessons learned during the past few months. To access the canopy of a 'wild tree' (a tree that has never been climbed before) the first step is to rig it. This is usually the most difficult part of canopy research. First, old-growth forest are always very dense, making it hard to see through the canopy and very difficult to shoot the rope to the canopy. EPA researchers use a crossbow (150 lbs or bigger) to shoot a fish line into the desired branch, connect it to a thicker line, and then to a climbing rope. The tree canopy is always an unknown. When you ascend a rope there are many obstacles to overcome, and in my opinion: pulling ropes is certainly a much harder task than climbing. Very often, when you arrive to the supporting anchor you find out that you are hanging of a dead or broken branch, and then is when it get really scary. I learned a convenient climbing technique from a professional arborist in Portland Oregon, Brian French. And I was able to practice the newly learned climbing technique doing field work with EPA. The single rope system is lighter weight than other systems and it will be of great benefit on my long hiking expedition in Taiwan. The first time I used this technique for a long descending the rope was burned black! I went back to Brian and he told me how to improve the 'prusik hitch'. Using borrowed gear can be tricky but once I learned to work with it field work became much more enjoyable. For me the canopy allometry measurements probably were the hardest part of that field work. Thus, it is the only (and cheapest) way to understand the canopy structure of an ancient tree in the old-growth forest. I hope Lidar technology improves in the future to eliminate this step. But until then we will have to hang on the canopy for hours to days to measure a tree girth every 6 feet, and branch characteristics (eg. angle, direction, width, leaf ration etc). Imagine a 200-feet tree with more than 100 branches! Then science stops being romantic! My main research interest is in monitoring canopy microclimate. The EPA climatogist Ron was so kind to demonstrate how he installs a weather station and shared his tricks on modifying weather sensors and other equipment's. EPA has been collecting high quality climate as well as tree data for more than 20 years! As a field ecologist, I know how devoted and determined those guys are. I am so glad I had the opportunity to meet these serious scientists in the Oregon! Study tour to the Mill: Between the Forest and Frame! The Pacific Northwest is well known for its forestry and lumber industry which are the mainstay of its construction industry. A prominent part of the supply chain is the processing of these logs into timber products needed for all types of building projects. 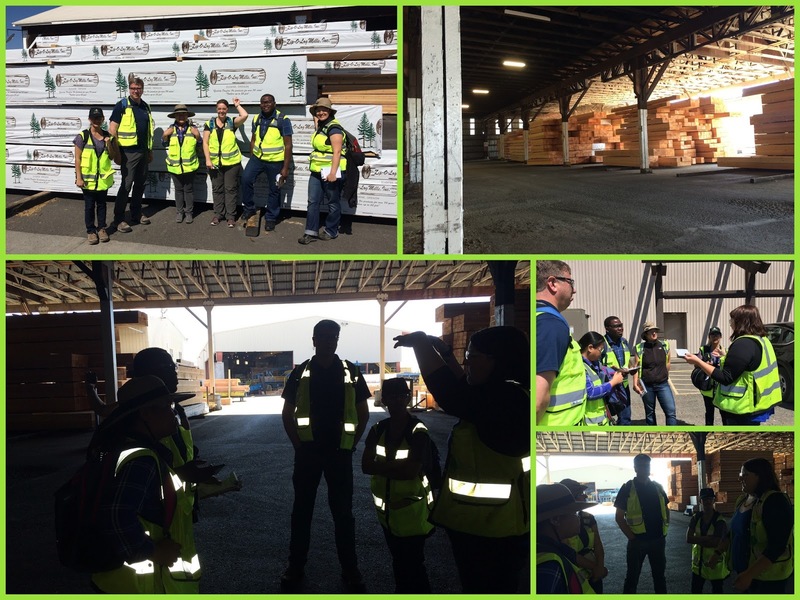 Our study-tour goal was to gain firsthand knowledge in the processing capacity and handling of logs to dimensional lumber. Zip-O-Log Mills is a 3rd generation family-owned business founded in 1944 based in Eugene Oregon (2hrs south of Portland). The company has made its great reputation producing high quality products and on-time delivery. The tour was conducted by KayCee Hallstrom, a fourth-generation family member, daughter of one of Zip-O- Log's current owners. The Mill prides itself in its zero – waste, fully automated production line, capable of processing up to 52 feet long logs. The logs are sourced from SW Washington and NW to Central Oregon throughout the Willamette valley, mostly from private forests. When selecting the logs, ring count and aesthetics matter the most. 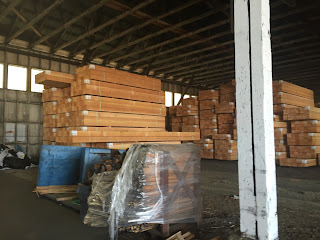 The logs (timber) are delivered to Zip-O-Log log yard where they are scaled and graded by the Columbia River Log Scaling & Grading Bureau (a third party). 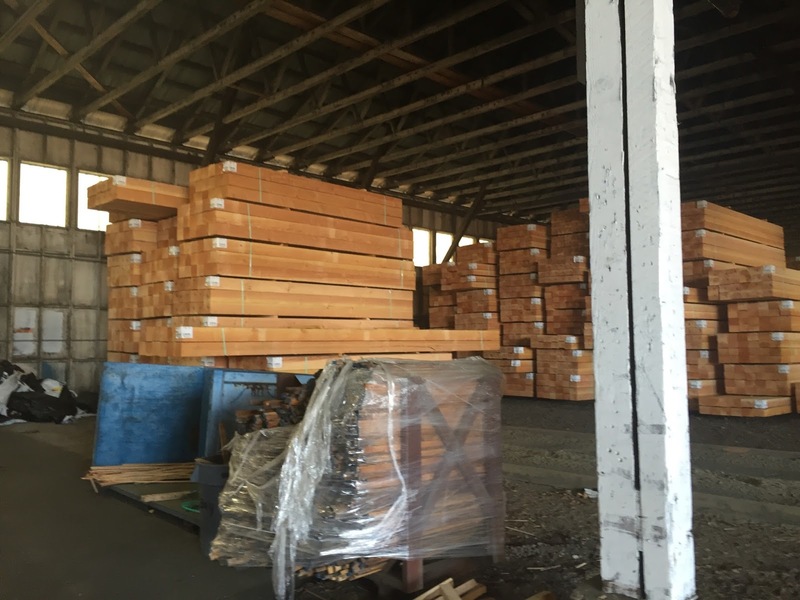 The sawn lumber is graded by Zip-O-Log graders following The Pacific Lumber Inspection Bureau (PLIB) grading guidelines (third-party). 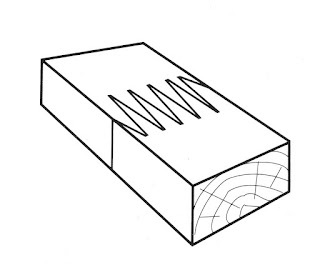 Grading allows to segregate boards according to their overall quality: grain direction, length, width, knots presence and defects as well as general appearance. The logs are singly picked and loaded by a giant grapple machine into a log in feed deck. Each log is milled using scanners and optimization software to determine the most efficient way to cut the log for pre-ordered dimensional lumber. Through a series of chain conveyors, the log is rolled into step feeders into the de-barker where it is first sprayed with water to remove of dirt and debris as well as to help cooling the debarking machine. After debarking, boards are cut by laser cutting blades. The process is repeated further through four other laser cutting blades until the desired lumber size is achieved while cutoffs are rolled over into the grinder for biomass fuel. The lumber is trimmed by length and size for final grading and rolled over through a 16 level sorter based on length and grade. Then detailed measures of quality controls are involved. With the forklift the lumber is stacked according to its size and tag. The grading is based on three broad categories: Green, rough and surfaced. Some of the lumber is kiln dried. ‘Glulam’ as is popularly called is manufactured by finger joining lumber along its length and applying adhesive among the ply/members either liquid to liquid or liquid to powder under high pressure. The 'glulam' then undergoes various quality checks and standard testing for strength. As the push for environmentally friendly product advances, engineered wood continuously give architects and engineers one less thing to worry about in creating structurally stable and aesthetically alluring designs (innovative mass timber buildings). Developing countries should embrace the unlimited possibilities of engineered wood in creating environmentally friendly designs as well as be open to continuous research in surmounting the inherent challenges in the use of local resources for construction. Abiodun Solanke is an architect from Nigeria promoting the adaptation of timber framed buildings in his home country. For more information contact him at asolanke@worldforestry.org or after ending the fellowship program in November 2016 at abbeylight@gmail.com.